This book offers a complete translation of the Majjhima Nikaya, or Middle Length Discourses of the Buddha, one of the major collections of texts in the Pali Canon, the authorized scriptures of Theravada Buddhism. This collection--among the oldest records of the historical Buddha's original teachings--consists of 152 suttas or discourses of middle length, distinguished as such from the longer and shorter suttas of the other collections. The Majjhima Nikaya might be concisely described as the Buddhist scripture that combines the richest variety of contextual settings with the deepest and most comprehensive assortment of teachings. These teachings, which range from basic ethics to instructions in meditation and liberating insight, unfold in a fascinating procession of scenarios that show the Buddha in living dialogue with people from many different strata of ancient Indian society: with kings and princes, priests and ascetics, simple villagers and erudite philosophers. Replete with drama, reasoned argument, and illuminating parable and simile, these discourses exhibit the Buddha in the full glory of his resplendent wisdom, majestic sublimity, and compassionate humanity. The translation is based on an original draft translation left by the English scholar-monk Bhikkhu Nanamoli, which has been edited and revised by the American monk Bhikkhu Bodhi, who provides a long introduction and helpful explanatory notes. Combining lucidity of expression with accuracy, this translation enables the Buddha to speak across twenty-five centuries in language that addresses the most pressing concerns of the contemporary reader seeking clarification of the timeless issues of truth, value, and the proper conduct of life. Winner of the 1995 Choice Magazine Outstanding Academic Book Award, and the Tricycle Prize for Excellence in Buddhist Publishing for Dharma Discourse. 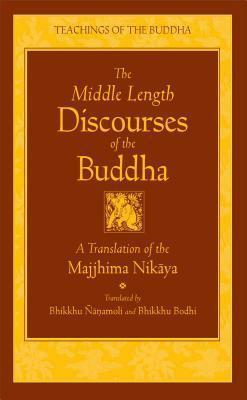 This book offers a complete translation of the Majjhima Nikaya, the Middle Length Discourses of the Buddha, one of the major collections of texts in the Pali Canon, the authorized scriptures of Theravada Buddhism. Venerable Nanamoli (1905-60) was born in England and became a monk in Sri Lanka in 1949. During the eleven years he spent as a monk, he translated from Pali into lucid English some of the most difficult texts of Theravada Buddhism, including Buddhaghosa's Path of Purification. Ven. Bhikkhu Bodhi is an American Buddhist monk from New York City, born in 1944. He obtained a BA in philosophy from Brooklyn College and a PhD in philosophy from Claremont Graduate School. After completing his university studies he traveled to Sri Lanka, where he received novice ordination in 1972 and full ordination in 1973, both under the leading Sri Lankan scholar-monk, Ven. Balangoda Ananda Maitreya (1896-1998). From 1984 to 2002 he was the editor for the Buddhist Publication Society in Kandy, where he lived for ten years with the senior German monk, Ven. Nyanaponika Thera (1901-1994), at the Forest Hermitage. He returned to the U.S. in 2002. He currently lives and teaches at Chuang Yen Monastery in Carmel, New York. Ven. Bodhi has many important publications to his credit, either as author, translator, or editor. These include The Middle Length Discourses of the Buddha (Majjhima Nikaya, 1995), The Connected Discourses of the Buddha (Samyutta Nikaya, 2000), and The Numerical Discourses of the Buddha (Anguttara Nikaya, 2012). In 2008, together with several of his students, Ven. Bodhi founded Buddhist Global Relief, a nonprofit supporting hunger relief, sustainable agriculture, and education in countries suffering from chronic poverty and malnutrition.